Was Jack the Ripper Influenced By Violence In The Media? In 2014, as technology continues to make great leaps forward, and with computer games, films and television finding ways to treat us to ever more realistic and graphic depictions of violence, there are constant calls for the more extreme elements of these “entertainments” to be curbed, as constant exposure to them might lead children and teens to imitate the hostile behaviour they have witnessed on screen. Interestingly, a similar argument was raging in 1888, at the height of the Jack the Ripper murders, as society struggled to come to terms with how an individual could perform such atrocities for no other reason than for pleasure. On that same Saturday The Illustrated Police News wondered if the public “…shouldn’t feel indebted for the horrible crimes in Whitechapel” to the “…highly-coloured pictorial advertisements to be seen on almost all hoardings in London, vividly representing sensational scenes of murder, exhibited as ‘great attractions'”. The mention of “Theatrical advertisements” is interesting in that there was a lot of controversy at the time over the stage version of Robert Louis Stevenson’s The Strange Case of Dr. Jekyll and Mr. Hyde was, at the time, playing at London’s Lyceum Theatre, with American actor Richard Mansfield performing the dual role of Jekyll and Hyde. His nightly transformations from one to the other were absolutely terrifying his audiences and had led some to believe that his Mr Hyde persona might not be all down to acting, and some were even wondering if Mansfield himself might be responsible for the East End murders. 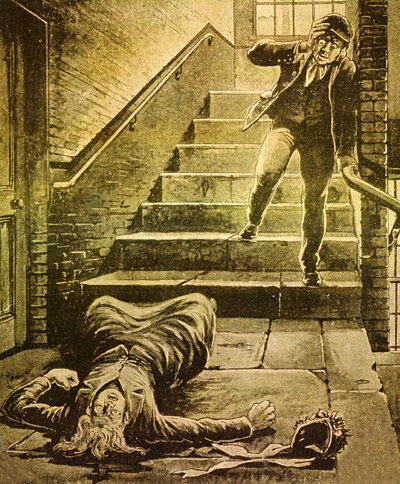 Laughable as the accusation might seem, the newspapers were beginning to draw a parallel between Mansfield’s stage depiction of the evil Hyde, and the all too real villain who was bringing terror to the East End streets of the Metropolis, as early as the second Jack the Ripper murder, that of Annie Chapman, on the 8th September 1888. So, by the time of the second Jack the Ripper atrocity, it is more than apparent that, in the eyes of certain elements of the media at least, the identity of the Whitechapel murderer himself might not have been known, but the motivation for his crimes lay squarely at the door of the way that violence was being glorified and sensationalised by cheap fiction and by the theatre. In many ways, the same arguments are still being made and, it seems, we are still as uncertain, or perhaps as unwilling, to draw a correlation between the violence in the media and the real thing as we were in 1888?